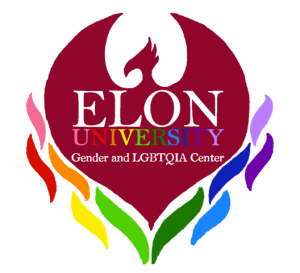 In support of the mission of Elon University, the Gender & LGBTQIA Center partners across campus and community to support, advocate, and educate around gender and LGBTQIA identities to create an inclusive campus community of equity, justice, and academic excellence for students, employees, and alumni. Note: “LGBTQIA” encompasses people with Lesbian, Gay, Bisexual, Transgender, Queer, Questioning, Intersex, and Asexual identities. 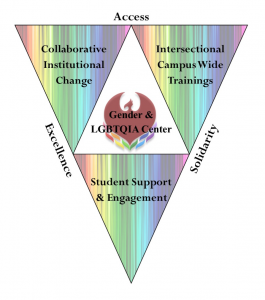 All GLC events and initiatives are open to people identifying as “LGBTQIA & Allies” which includes straight allies. CampusPride is a non-profit organization dedicated to making higher education safer and more inclusive across LGBTQIA identities and communities. On their CampusPride Index benchmarking assessment tool, Elon University earns five out of five possible stars and the highest ranking among Southern schools! Read a recent article about our progress or find out more about our ranking.